While tens of thousands of locals pour out of New York City for a Fourth of July vacation, millions of tourists come into New York City to visit—and millions of New Yorkers stay home, too. There's plenty to do to celebrate Fourth of July in Brooklyn, one of the five boroughs of New York City, whether you are visiting for the first time or staying home for the holiday. For more than 100 years, the Nathan's Famous Coney Island Hot Dog Eating Contest has been held at the site of the original store on the Atlantic Ocean boardwalk and adjacent to Coney Island's Cyclone roller coaster. In 2010, the competition was doubled to include both a women's and a men's division for the contest. About 40,000 onlookers watch as a roster of preselected competitors stuff as many hot dogs into their mouths as they can in 10 minutes. Not just anyone can participate. This event is for serious competitive eaters only. The average winner eats about 70 hotdogs in the allotted time. 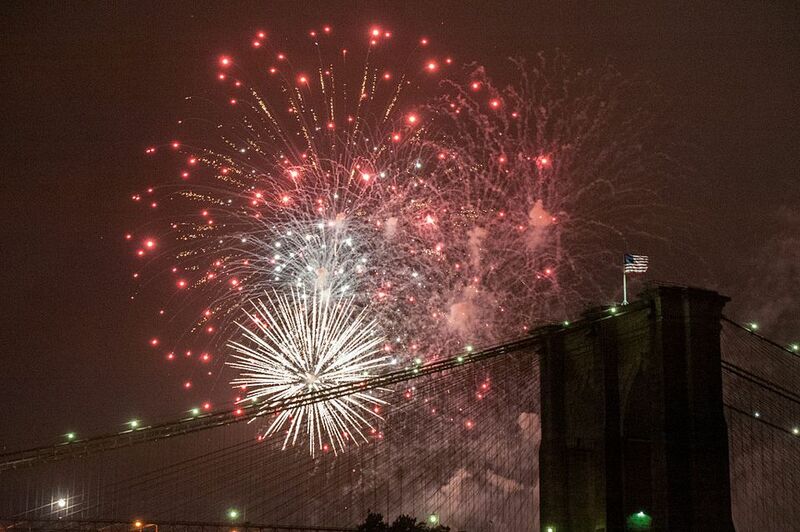 Most years, the Macy's July Fourth fireworks show is along the East River. When it is, then the best spots to the see the 25-minute pyrotechnic display is from Brooklyn Bridge Park, the Brooklyn Heights promenade, boats, and rooftops and venues that have views of the Brooklyn Bridge. Check online each year, because some years the fireworks have been fired off from the Hudson River, making fireworks very difficult to view from Brooklyn. If you go to Brooklyn Bridge Park, go to piers 1 through 6. You will want to enter on Old Fulton and Furman Street; Joralemon Street and Furman Street; or Atlantic Avenue and Furman Street. From the Brooklyn Height promenade, enter on Columbia Heights and Pineapple Street; Montague Street and Pierrepont Street, or Pierrepont Street and Remsen Street. For boater viewing instructions, call Macy's marine hotline at (212) 494-5243. You are encouraged to find any rooftop with views of the top of the Brooklyn Bridge. Check out a list of rooftop bars, many of which you can catch a glimpse of the fireworks. Or, you spend Fourth of July at Brooklyn Grange, a rooftop farm in the Brooklyn Navy Yard (this sells out quickly, call ahead). What else do you do on July Fourth weekend? Have a barbecue, of course! You've got the friends. But what about the food and the grill? Find out where you can get good quality meats and where you can grill them. You can always go to the supermarket for packages of hot dogs (including Brooklyn's homegrown Nathan's brand), but for interesting, fabulous, and freshly made hot dogs head to a butcher. You can get everything from vegetarian hot dogs, chicken sausages, or kielbasa, and you've got a lot of choices in Brooklyn like Staubitz Market in Cobble Hill, Fleisher's Craft Butchery in Park Slope, the Meat Hook in East Williamsburg, and Kiszka Meat Market in Greenpoint for Polish sausage. If you're a city dweller, you might not have access to a backyard, but no worries, head to one of Brooklyn's many parks. But be forewarned, you can't just set up your grill and fire it up. You can only barbecue in special areas, and it's smart to stake out your place very early in the morning (because a lot of other people will have the same idea). Viewing or taking part of historical re-enactments have this wonderful ability to give you a momentary sense of what it was like to live at that time. For July Fourth, in Prospect Park there is a mock Declaration of Independence signing to encourage children to feel like they are part of that meaningful historic event. On the Fourth of July, your kids can participate in the mock event at the Lefferts Historic House ($3 suggested donation). Lefferts Historic House is located inside Prospect Park near the park’s entrance, at the intersection of Flatbush and Ocean Avenues and Empire Boulevard. Afterward, your child can ride the carousel that dates back to 1912. Since 1979, BRIC has launched the Celebrate Brooklyn! Festival in Prospect Park, a series of free music concerts for the summer in the bandshell. The music lineup includes several acts over the July Fourth weekend. Get there early for seats or a good spot on the grass. If the weather cooperates, explore Brooklyn at your own pace. The borough is full of interesting neighborhoods, eateries, and shops that are all each quite different from the next. 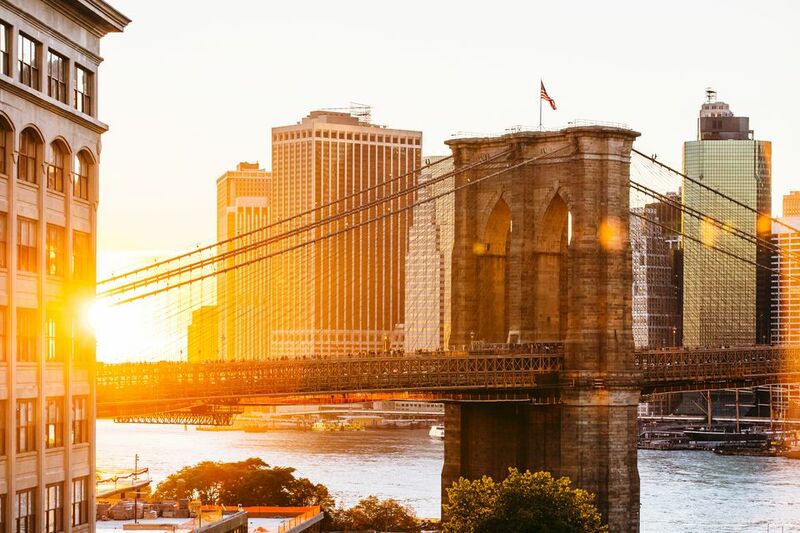 For a self-guided tour of different neighborhoods during July Fourth, consider Dumbo, Brooklyn Heights, Park Slope, or walk the Brooklyn Bridge to or from Manhattan. Dumbo: Dumbo's Front Street makes for a nice, short walking tour. This area, an acronym for "down under the Manhattan Bridge overpass," was once an industrial neighborhood that has been transformed into a hip, high-rise haven for artists, bankers, and a handful of trendy stores, restaurants, and food shops. Brooklyn Heights: Take a walk through historic Pierrepont Place in old Brooklyn Heights and you will see stately homes, great Manhattan views from the airy promenade overlooking New York Harbor, a bevy of educational institutions, and the seat of Brooklyn's municipal government. Park Slope: Explore a leafy Victorian neighborhood of fine Brooklyn homes in historic Park Slope south of Prospect Park. Explore the Brooklyn Botanic Garden, then visit the adjacent Brooklyn Museum. It's a safe walk, but wear comfy shoes, and bring a map. Walk the Brooklyn Bridge: Walk from Manhattan across the iconic Brooklyn Bridge. The trek is about 1 mile, which can take you about an hour, give or take, definitely longer if you stop to take photos and admire the view. Once you arrive in Brooklyn, you can explore DUMBO or Brooklyn Heights on the other side. All over the country, Independence Day is celebrated by going to the beach with family and friends. Brooklyn has several beaches. You can consider Coney Island, Manhattan Beach, and Brighton Beach. Coney Island already has the hot dog eating contest, so you might want to check that out, ride the Cyclone, then hit the sand. A suggested 12-hour July Fourth itinerary for Coney Island might help you plan your day. July Fourth, it turns out, is a good day to go shopping. Some national chains have sales. Others might have hot one-day specials. Some local mom-and-pop stores might take the day off, but at least in Brooklyn, gift shops, independent booksellers, and food stores are likely to be open. Check before you go. And, if the day is a scorcher, head over to one of the large malls that are air-conditioned, like Atlantic Mall.